With the help of academic researchers, we created this book to give you a few ideas about how to conduct research in your classroom, school, or even district. They’re basic, easy-to-conduct studies that you can use as is or adapt to your own needs. We hope that by investing time to conduct one or more of these studies, you’ll get a better understanding of how iPad is impacting your students and school and what your next steps might be. 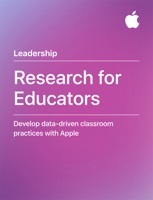 Research for Educators is part of the Leading Innovation book series, designed for education leaders. It presents essential learnings ​from over 40 years of working alongside educators ​in schools around the world. These resources offer ideas and guidance ​for innovating with Apple at your school.